Persuasive stories are one of the most powerful copywriting techniques in a copywriter’s toolbox. As you set about writing to persuade, it’s easy to get wrapped up in focusing on the mechanics of running your organization. Instead, start off with writing about the people you serve. Not only will you show readers the exciting results about your wonderful work, but you’ll also inspire them. And along the way, you’ll be encouraged, too! 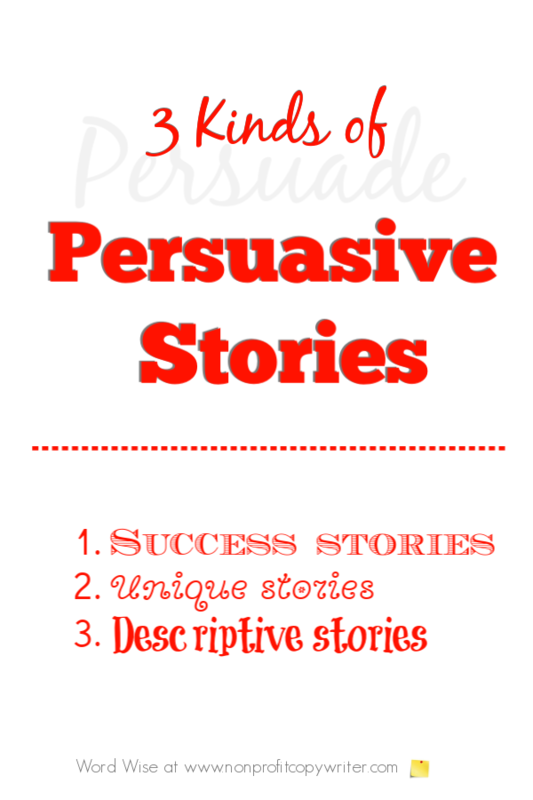 Here’s how to write 3 kinds of persuasive stories about the people you serve. When you take the time to find the everyday triumphs among those you serve and share them with your readers in stories, you earn trust from those who invest in you. Readers will cheer for the incarcerated felon who finds faith or the 4-year-old cerebral palsy victim who takes his first steps. Results are inspiring and make you want more. That’s why a reader who is motivated by your heroes takes action to support you – and is likely to stay with you over time. In contrast, guilt is a motivator, but a short-lived one. A reader who feels guilty will take action because you told her to as a way to relieve her momentary shame, but she may not necessarily embrace your cause long-term. For instance, tell the story about Andrew, who was placed in foster care when his parents were arrested for drug trafficking. Although considered bright, Andrew became a classic underachiever in school. A school counselor connected him with one of your after-school mentors who met with Andrew twice a week. That relationship turned Andrew’s life around. Andrew recently won the state’s highest math and science honor for middle-schoolers and he plans to become an engineer. Don’t you want to give Andrew and his mentor a couple of high-fives? I’m anxious to know more about him. And I want to know how your program can produce more Andrews. Persuasive stories like Andrew's pull me in. Problems are everywhere. Heroes and solutions are rarer. Yet your organization is full of them. Stories of success build trust – and trust is persuasive. How are you different from other organizations in your segment? Every organization was launched to fill a special need. (If you don’t know what makes you unique, take some time to figure out your Unique Selling Proposition.) Write a story that demonstrates how your uniqueness meets a particular need for a person you serve. CEO Toby had attended dozens of leadership development events, but had never been to one that provided actual templates she could use right away to make changes. But after she attended your strategic planning workshop, she immediately went back to the office, used your templates, and created new mission and vision statements for her ministry. Each morning since then, she has shared those newly-created principles with her staff. Now, two years later, her staff members doubled their ministry capacity. Equally exciting: they are energetic and passionate at work. The ministry culture completely transformed after Toby attended your workshop, because you gave her practical tools she could use right away to focus her ministry. Don’t you want to get your hands on those templates? They are unique from what anyone else offers – and uniqueness is persuasive. Descriptive stories let us taste the clean water from the Kenyan well right along with the village elder and his great-grandson. Stories let you hear an inner city youth orchestra and trace a young cellist’s escape from the ghetto through her music. Stories let you be the father hugging his healing child, smell the fresh tomatoes in the community garden along with those who hoe it, and experience the companionship of an adopted pet where loneliness once reigned. Well-written, descriptive stories weave together senses and feelings. Tell stories using details. In doing so, you connect with readers and move human heartstrings to care and act. Emotions are persuasive.